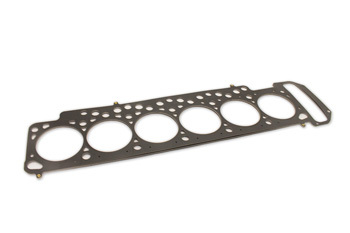 The VAC Motorsports M30 Multi Layered Steel (MLS) Head Gaskets are designed for much higher combustion pressures than all other head gaskets including OE. Bore mm / Thickness (in. ): 88mm / 0.070" 88mm / 0.080" 88mm / 0.098" 88mm / 0.120" 88mm / 0.140" 89mm / 0.140" 90mm / 0.140" 92mm / 0.070" 92mm / 0.098" 93mm / 0.070" 93mm / 0.080" 93mm / 0.089" 93mm / 0.120" 93mm /0.140" 95mm / 0.070" 95mm / 0.080"
The VAC Motorsports M30 Multi Layered Steel Head Gaskets are designed to withstand much higher combustion pressures than OE factory head gasket, or other conventional or modified head gaskets. Made to the finest specifications and run all around the world, standing up to high HP levels on the street as well as in motorsports; they are a multi-layer gasket of which the steel layers are coated by an outer layer of patented sealing material to ensure proper retention of fluids so no copper spray or gasket helper is needed. This design ensures a complete combustion chamber seal and elimination of failure due to weak factory gaskets blowing out under boost or high performance use. These gaskets are available on a variety of thickness' from as thin as .030" up to .140". We use our MLS gaskets on every performance engine we build. OE size is expressed as .070"
For Turbo and high performance applications, these gaskets are great! With our wide variety of in-stock gaskets, worrying about having a custom gasket made is no longer an issue. For special needs, please call or email. Since the M30 is already a low-compression engine, we typically recommend an .080-.098 thickness gasket so compression is no dropped too much. We strongly recommend the use of ARP studs when fastening the head to the block for best results. No silicone or gasket maker should be used on these gaskets, copper spray is OK but not needed. For best possible results, your cylinder head mating surface must be professionally cleaned and professionally resurfaced before you install an MLS gasket. From Steve Melrose of Bellevue, Washington on 9/22/2013 .